Wine presentation that's all you! 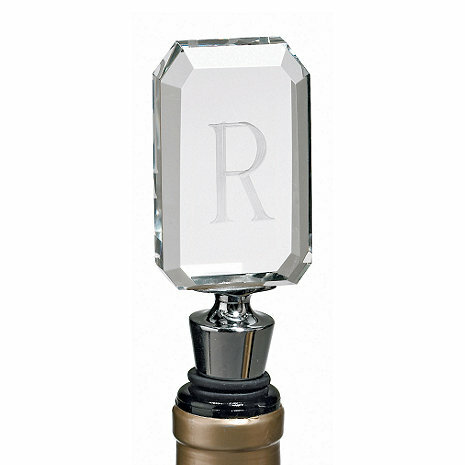 Personalized with your initial, this clear acrylic bottle stopper provides an elegant seal to opened wine. The stopper's weighty chrome base is fitted with a rubber gasket to keep the air out and the flavor in. Sure to become a treasured keepsake. Gift-Boxed. Note: Please specify the single letter you would like. Font color, style, size or placement can not be changed. Once ordered, personalized products are non refundable unless there was an error in production. you couldnt ask for a more stylish gift i gave it to three people with a bottle of champagne from wine express...it made the perfect gift! Bought both the Personalized 1 Initial Crystal Bottle Stopper and the Age gets better with wine, Party Girl Wine Glass for my friends 40Th Birthday. She loved both of these items. Her favorite being the Bottle Stopper. The wine stopper is very elegant and classy. I plan to purchase one for my self. You will get many compliments. This item is very sturdy, perfect for gift giving! The wine glass is beautiful and is sure to please. Could not be happier with the gifts I chose. You will not be disapointed. Love this wine stopper. Personalized and classy looking!! I ordered several items to be personalized on a pretty tight timeline. The items were shipped quickly and they exceeded my expectations. If you are looking for a personalized gift, I highly recommend Wine Enthusiast! Wonderful gift for a wine "enthusiast" ! Perfect! Purchased as a gift and the recipient loved it! Thanks! Sent the stopper to my niece as a thank you gift. She liked the gift a lot. This personalized bottle stopper was a great gift for someone who has everything. The recipient was impressed.